I've had several people ask me where and how I record my steel songs.. I have owned a commercial recording studio of one sort or another since the 70s. I started out with a little radio shack 2 track then a Tascam 4 track then 24 track 2"and now record to ProTools.. The photo is my current studio... 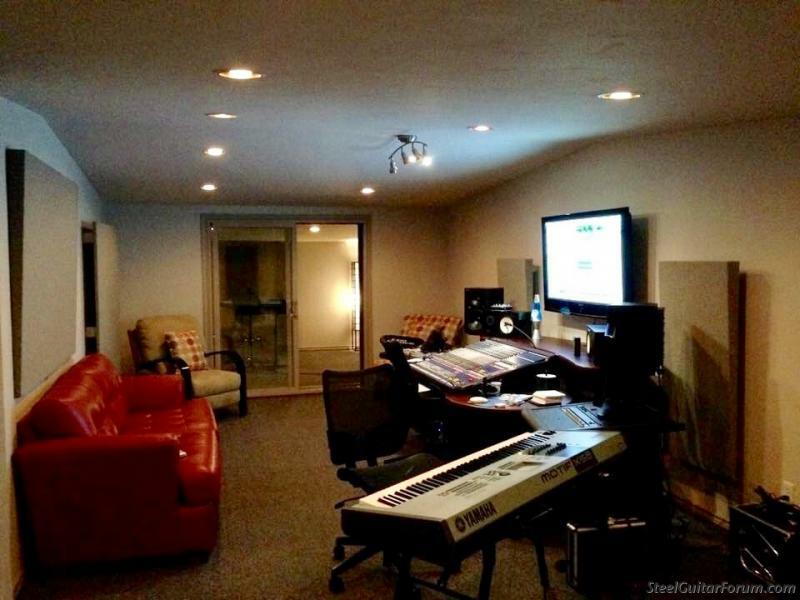 Most of the songs I'm doing on my project are written and produced in this room.. I have sent some of the tracks to a few of my friends that have added their parts and then sent them back to me.. It's a great and efficient way to work.. Last year I moved the studio to my home so I could spend more time on my personal project.. I hope this helps and answers some of the questions you've had.. In my signature at the bottom are links to two of my songs. Have a great day and hope to see & hear you in Mesa. Wally, since I’ve become aware of you, I’ve been a fan, and love everything I’ve heard you do... I’ve especially been impressed with your tone, which to my ear is about as good as I’ve heard and truly something to strive to achieve... Thanks for giving us all a glimpse into how you do what you do, and get what you get. Really nice Wally, but where are all the cords and stuff on the floor ? Great tracks and beautiful room as well, thanks for posting. You are writing these songs as well as recording them, Yes? Goodness, you are a talented man! Just 'cause I look stupid, don't mean I'm not. First class stuff all the way Wally!! Thank you Quentin, I appreciate that! Lovely and lot's of quality work. Kudos! Is that a real AC? Great sounds Wally! I lost count of the years I've run around in a studio like a chicken with his head cut off making sure all the musicians are happy but I've always said thay only pro musicians and audio engineers that make a living or could make a living playing and recording music can recognize the talents of a great recording engineer. The first talent is making sure everyone is relaxed maybe offering a bit of humour before you start. You know the story. A lot more goes into running a studio than meets the eye. Just like learning to play a musical instument a recording engineer works for years on their craft too. To get state of the art sound like you get Wally just takes an experienced trained ear that only comes with audio awareness. Learning what a good sound even is. Kudos friend! Audio engineering at it's finest! Thanks Dale! Guys they play like you and Wally make an engineers job a whole lot more fun. David and Dale, I appreciate all the kind words! As both of you know its all a work in progress. As long as I'm still having fun and learning I hope to keep at it. I've actually moved and built a new studio since this post, this a pic of the new one. Its more of a studio/music room now, this one was last week when I was putting some guitar parts down on the project so its kind of a mess.. Take care! Oh Wally! It's got that cozy Vince Gill studio look with a music store on the side. Love it! You just need a baby API or Neve for your centerpiece. Lol! Everyone knows you can make a hit with a Yamaha board and go shopping in a Ford Fairlane but the nice stuff gives everyone something to talk about and it really does look and sound good. Amazing the sound we can get now with one decent preamp, a microphone, DI box, a convertor and a laptop computer. In 1970 it took $150,000.00 to get the equipment to even begin to sound like a professional production plus tons of know how. It still takes know how but not a whole lot of equipment like in the days when we recorded by brute force and needed a space the size of an aircraft hanger to set up a studio. Great days musicians are living in now! And an accurate good room that controls the lows! Accurate monitoring enviroment is the most important equipment you can own and for that reason I built my last two studios and control rooms with solid concrete walls then spent another $10,000 in the control room building bass traps, speaker soffits stuffed with 2 ft. thick of corning 2" compressed insulation. The last room was flat down to 20hz with zero bass build up and no phase cancellation with non-parallel walls and ceiling. I even built absorbent ceiling clouds that also contained the enviromental lighting. My very first customer was Ray Price. I didn't even have the interior built when he came to that studio but built a makeshift vocal baffle that he stood in front of that worked like a charm. It killed all the echo and phase cancellation in that solid concrete block room that sounded like an echo chamber. As I said before. Just like a guitar picker learns to play guitar an engineer learns his craft too. Equipment and multi-million dollar rooms are only as good as the operator. I've heard plenty of useless recording come out of them. With that said I still do most of my mixing in the comfort of my living room but I have lots of junk in it to break up the sound and it also has solid concrete walls and foundation. Sometimes and to varying degrees a frame room will start resonating and create bass that isn't on the recording as well as allow an intolerable amount of outside noise in. Just go listen to it in your car. If it doesn't sound the same as what you are hearing in the control room then something is wrong with your room. For those recording at home a good set of powered speakers is essential and you can use bookshelves filled with books for diffusion, drapes, rugs, carpet, etc, to get you a good monitoring enviroment. My very first customer was Ray Price. Yup studios are expensive and difficult to build. Today you can get gobs of software that take the work out many mixing jobs but so far the room does not come with it although they try and remove the room from the equation with near fields or a software trick. Experiments with virtual reality are on going and while that might be something to look forward to, it could be a pandora's box as long as we still use the shells on the sides of our heads..
Sound has a nasty habit of literally going through walls, bass with long wave lengths, hard to tame, builds up in a room. Room boundaries make it critical for where the speakers are placed for the mix position. Then getting the phantom image at your mix center is something to achieve. I used Helmholtz resonators and a raised floor with sand box. The walls and floors are concrete. And yes I made acoustic clouds, slanted ceilings with decompression at the mix position. It wasn't cheap and it didn't happen in a week. After that it's learning the monitors. It's an ongoing adventure in sound and one never stops learning. Mistakes happen just from working on different songs. 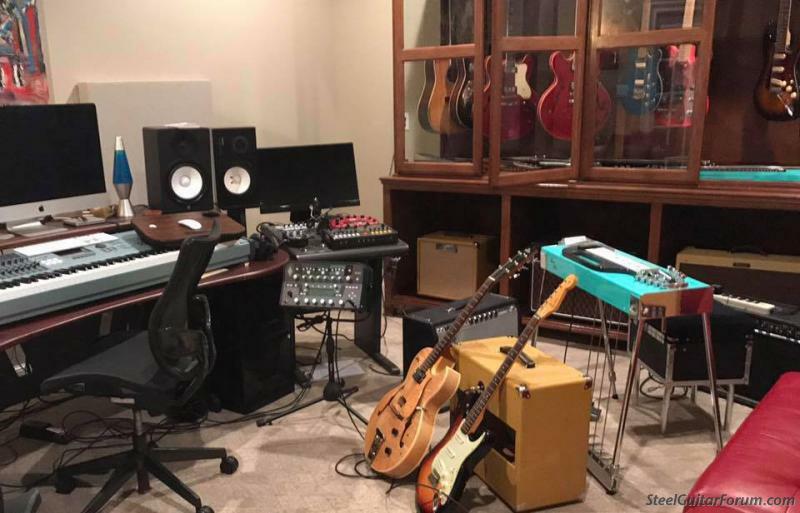 Reason why some producers will go from studio to studio to find the studio that best fits the band which may make one band sound good but not another. Guess that's why it's called a craft. The room is important for sure although I've never had the privilege of working in a great one. I've had at least 10 studios since I started back in the late 70s. When I go back and listen to tracks from these studios its interesting to think back to the rooms they were done in. It really all comes down to the quality of the music being recorded. Like you all, I always take them to my car to make final level decisions and to check the low end. One of my favorite sessions was for a friend of mine and great sax player Don Wise. Don and I played together for many years and he played with Delbert McClinton for almost twenty years. This is a cut from one of his CDs that I did. This project was recorded while I was having a house built with a 1800' basement studio. At the time we had sold our house that had a great garage studio so we were living in a two story duplex. There were two bedrooms up stairs so I had one as the control room and one as the cutting room. I had just got the temporary studio set up when Don called ready to record. Two days later Don along with Delbert's band pulled up at our house and we started recording.. It really all comes down to the quality of the music being recorded. Yes a good well arranged song almost mixes itself.